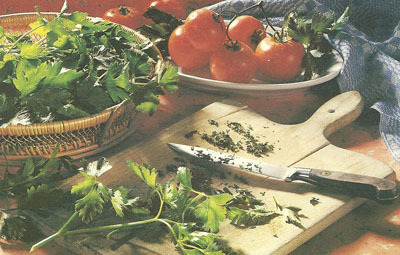 Now grown all over theworld, parsley originated in the Eastern Mediterranean region. For more than 2,000years, it has been known as a medicinal herb. The ancient Greeks valued the seeds and roots of the plant for their soothing, diuretic effect on those with kidney and bladder ailments. Today, parsley is still used primarily as a diuretic. In addition, it strengthens the digestive system and helps alleviate stomach and liver problems.In folk medicine, parsley is recommended for women who have irregular menstrual periods. As a diuretic, it may also ease the bloating that some women experience before their periods. In addition, parsley leaves area good source of many vitamins and minerals—including iron, which is important for the proper formation of red blood cells, potassium and vitamin C.
Parsley is related to celery, carrots and parsnip, which all belong to the family Apiaceae (also Umbelliferae). Botanical names for parsley types are Petroselinum crispum (curly leaf parsley), P. neapolitanum (flat leaf parsley) and Petroselinum crispum subsp. tuberosum (root parsley). Root parsley is not parsnip (Pastinaca sativa) even though they are used in a similar fashion in the kitchen. Likewise, flat or Italian parsley has a sharper taste, with more essential oils than curly leaf, but can be used interchangeably, as taste allows. Parsley, a Mediterranean plant, came to Germany via Roman Legionnaires as the Roman Empire expanded. It was cultivated in German and French medieval cloister gardens as a medicinal plant and was rumored to cure all kinds of illnesses and symptoms. In Germany, the curly-leaved parsley was cultivated to distinguish it from a poisonous cousin, Fool's Parsley, which is also related to Hemlock. 1. Wash parsley in cold water and strip the leaves from the stalks. Coarsley chop the parsley. Then peal and dice the shallots. 2. Mix together the heavy cream, cream cheese, lemon juice, parsley and diced shallots. Season to taste with salt and white pepper. 3.Peel the scallions; cut into thin rings. Dice 2 tomatoes, season with salt and cayenne pepper to taste; mix with the scallions. 4. Cut the remaining 2 tomatoes into 1/2 inch slices. Cover them with parsley spread and top with the tomato -scallion mixture.